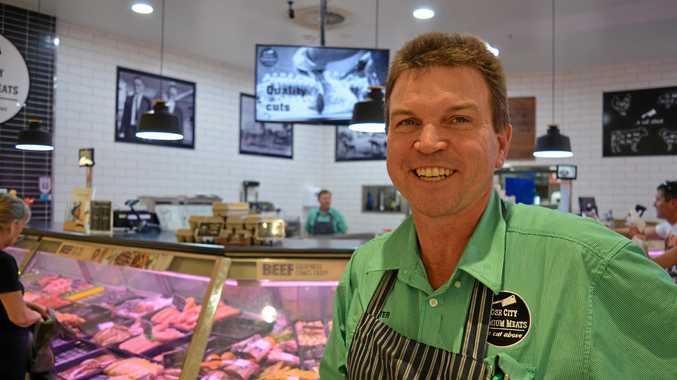 CANNING Downs stud owner John Barnes has upped the ante in the battle over Plumb’s Chambers by putting forward a $500,000 bid to buy the controversial site from Rose City Shoppingworld owner the McConaghy Group. Court documents obtained by the Daily News detail the heritage campaigner’s bold bid to buy and restore the two buildings. Mr Barnes is also behind a legal action to prevent demolition of part of the site by the group. The State heritage-listed buildings at 82 and 84 Fitzroy St, opposite Leslie Park, stand in the way of an expansion of the Shoppingworld. The State Government has already approved demolition of the older building at 82 – thought to be the oldest shop in Queensland – as it was mistakenly left off the Warwick Shire Council’s heritage list. The McConaghy Group has agreed to restore the front of the sandstone building at 84 Fitzroy St, next to the police station, but wants to knock down its rear section to make way for a truck turning bay. In a statement provided to the Planning and Environment Court of Queensland, which has this week heard the Plumb’s case, Mr Barnes states his interest in the court proceeding is “purely directed to protecting the cultural heritage values of Warwick”. “For the purposes of protecting and restoring the buildings at 82 to 84 Fitzroy St, I would be prepared to purchase those properties from the current owner for the sum of $500,000 or market value,” Mr Barnes says in his statement to the court. Plumb’s was sold by the Hill family to the McConaghy Group in 2009 for $350,000. Sydney-based Mr Barnes – whose Canning Downs property was the first pastoral lease in Queensland – has consistently maintained the Plumb’s Chambers buildings, while neglected, can be restored and re-used. He has previously pointed to stables on Canning Downs, thought to date back to the 1860s along with 82 Fitzroy St, as proof that restoration of 150-year-old structures can succeed. Access to Rose City Shoppingworld from Haig Avenue, between Plumb’s and the police station, has been cut for several months while what has been termed urgent safety work can be carried out on the wall of number 84. Despite being authorised by the State Government on May 13 no work has started on installing what is understood to be a metal support brace. McConaghy Group owner Robert McConaghy did not return a call from the Daily News yesterday. Mayor Ron Bellingham said it was “difficult” for him to comment on the Barnes bid as council had given its own approval for the demolitions, but said council could be prepared to facilitate a discussion between Mr Barnes and the McConaghy Group on the shopping centre future if a sale of Plumb’s went through. “I do feel that a meaningful restoration of those buildings, while they are important in the history of Warwick, would be hard to achieve,” Cr Bellingham said. This week’s court hearing has been charged with deciding on the demolition of the rear section of 84 Fitzroy and if the court gives it green light – and the McConaghy Group rejects Mr Barnes’ offer – little stands in the way of the Shoppingworld expansion. Mr Barnes’ barrister, Chris McGrath, said last night the court hearing had been adjourned until next Thursday and a judgment could be several weeks or more away.